Chanalyzer offers the unique ability to identify signatures of specific electronic devices that may be interfering with any wireless network signal, enabling improved installation of wireless devices and faster troubleshooting. Includes 1 year Metacare:providing, updates, bug fixes and feature changes. 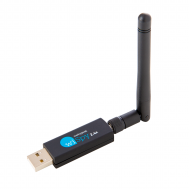 The Wi-Spy 2.4x is a small portable USB device designed for IT professionals. It scans and displays all activity in the 2.4 GHz spectrum. It helps to quickly identify interference, find the quietest channel, and analyze the quality of the signal. Save time and money by setting up your wireless network right the first time. What does Wi-Spy 2.4x do? We like to say that MetaGeek helps you visualize your wireless landscape — and a big part of that is our Chanalyzer software that turns Wi-Spy data into interactive graphs that make analyzing, troubleshooting, and optimizing your wireless networks a breeze. Plugged into a computer, the Wi-Spy 2.4x will track all the radio activity from WiFi, Cordless Phones, Microwaves, Zigbee, Radio, Bluetooth, and many more 2.4 GHz devices. Seeing these devices will help you locate and identify possible interference to optimize your WLAN. MetaGeek’s Wi-Spy 2.4x is capable of analyzing the 2.4 GHz band. The Wi-Spy works together with Chanalyzer to show you interference that affects 802.11b/g/n Wi-Fi or Zigbee activity. With this information, you’ll be able to choose the best channel for your wireless deployment.